Looking for a swoony, contemporary romance? 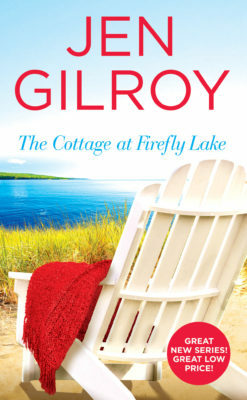 The Cottage at Firefly Lake by Jen Gilroy is out today! Be sure to enter the giveway, too! SynopsisIn the tradition of New York Times bestselling authors Susan Wiggs and RaeAnne Thayne comes an emotional second chance love story about redemption and finding your way home, the first in a new series by debut author Jen Gilroy. About the AuthorJen Gilroy grew up under the big sky of western Canada. After many years in England, she now lives in a small town in eastern Ontario where her Irish ancestors settled in the nineteenth century. She’s worked in higher education and international marketing but, after spending too much time in airports and away from her family, traded the 9-5 to write contemporary romance to bring readers’ hearts home.